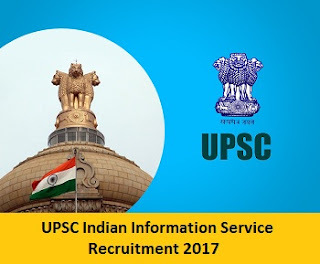 The Union Public Service Commission (UPSC) is India's central agency authorised to conduct the Civil Services Examination, Engineering Services Examination, Combined Medical Services Examination, Combined Defence Services Examination, National Defence Academy Examination, Naval Academy Examination, Special Class Railway Apprentice, Indian Forest Service examination, Indian Economic Service examination, Indian Statistical Service examination, Combined Geoscientist and Geologist Examination, and Central Armed Police Forces (Assistant Commandant) examination. Degree of a recognized University or Institute; (ii) Diploma/Post Graduate Diploma in Journalism/ Mass Communication from a recognized University/ Institution. OR Degree in Journalism and Mass Communication from a recognized University/ Institute. The Candidates must have studied concerned Indian language up to 10th Class. Maximum-30 years as on 30.06.2017. The selection process will be conducted by Union Public Service Commission. The category-wise minimum level of suitability in interviews, irrespective of whether the selection is made only by interview or by Recruitment Test followed by an interview, will be UR-50 marks, OBC-45 marks, SC/ST/PH-40 marks, out of the total marks of the interview being 100. In cases where the selection is made by Recruitment Test (RT) followed by an interview, the candidate will have to achieve a minimum level of suitability in their respective category at both stages i.e. ‘Recruitment Test’ as well as ‘Interview’. The minimum level of suitability in a case of RT shall be decided by the Commission on the case to case basis. · Now, you will find Union Public Service Commission, Home Page. · Click on Recruitment tab. · Now, Click on the Appropriate Link. · Fill the Application Form with relevant Information and attach all the required Certificates. · Now, download the Application Form. · Take a copy of Application Form for further use.